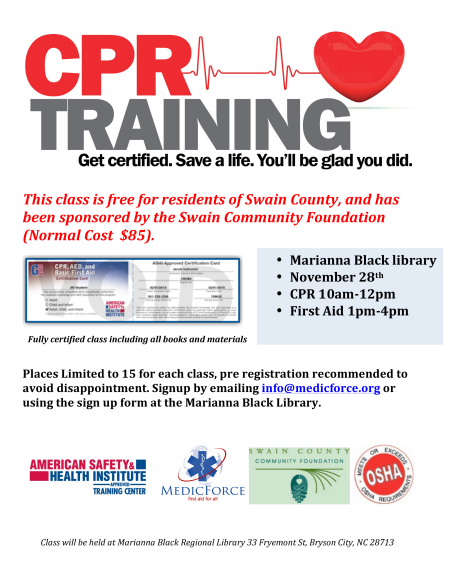 Marianna Black Library will be hosting a free First Aid and CPR class for Swain County residents on Saturday November 28th. This class that normally retails at $85 has been sponsored by the Swain County Community Foundation. The class is fully certified and will be taught by staff from the International Medical charity MedicForce. Places are limited to 15 for each class and to avoid disappointment residents should sign up at the library prior to the class or email info@medicforce.org to reserve a space. All materials and certification will be provided free of charge. Students must be at least 16years old. The CPR class is two hours and will run from 10am-12pm. First Aid will be three hours from 1PM-4pm.